A destination Award Winning Hotel comprising of over 300 rooms in the heart of Milan Italy. THDP are currently designing the new interiors for the Restaurant, Executive Rooms & Executive Lounge. The new Ground Floor Lobby, Lobby Bar & Check-in area were completed in May 2016 to a great success. Previously the ballroom, meetings & guest rooms & suites were completed by THDP. Hilton Milan Hotel is located in the heart of a major development, named as Directional Centre, starting in the 1950’s, the centre was partially developed, with the Galfa Tower of 1956 and the Pirelli Tower of 1958 from Gio’ Ponti which at the time was the tallest building of Milan. Architects such as Libeskin, Isozaki, Zaha Adid are designing and building future Milan landmarks for the Expo 2015 which is attracting new investments and renovation plans for the city. Torre Lombardia is the new Lombardy Region Headquarters. A 231m high office complex from Cobb Freed & Partners, the tower is one block away from the Hilton Hotel. Nearby is the Hines Tower from Cesar Pelli, which is the headquarter for Uni credit Bank. Milan is quintessentially elegant,stylish, sometimes quirky, modern but ultimately classic. A truly contemporary city, home to the world of fashion, arts, design and architecture, it’s like no other place in the World. The residents of Milan have a deep understanding of their own history and culture that is not just distinctly Italian, but ultimately Milanese. 'Quintessentially Milano' style means; furniture, lighting and finishes are luxurious, generous, comfortable and quintessentially Italian at heart. Effortlessly cool, young, and honest. A home from home for the guest, with a sense of style that is authentically Milanese. Elegant, but surprising at times, classic yet truly modern, the interiors speak a local language recognized by all the World. The inspiration for the interior colours, materials and fabrics is from the rich design and fashion heritage of Milan, carefully selected from renowned Italian designers and producers. Choices are distinctly Milanese, with a real sense of place, to create an Italian home from home, upscale residential, sophisticated with rich layered and subtle palette. Stylishly Contemporary and honest chic, delivering a sense of drama and surprise. The design narrative will also draw its inspiration from the history of design and architecture in Milan which is World renowned for its flair and expertise in fashion design, art, furniture design and production, architectural and car design inspiration. Finishes and materials are selected to express the sense of place and design heritage of Italy. Fabrics & eco leathers are luxurious and ‘upscale residential’ in feel, complying with local fire regulations as well as the demanding needs of a modern hotel. THE LOBBY & RESTAURANT "concept 45"
The design intention for the Lobby, is to create a greater sense of arrival, comfort and sense of place. The guests will enjoy a larger more unified space, with generous seating, dining and informal working areas. The new pod style reception desks will offer a more Informal check in experience with an adjacent seating area with a variety of styles and uses. Accessories from the Italian homes (large photos of bookshelves) are incorporated into the space giving it a local personality. The rear of the space is completed by an informal seating area which and next to that the concierge desk, flanked by additional storage and display shelving. 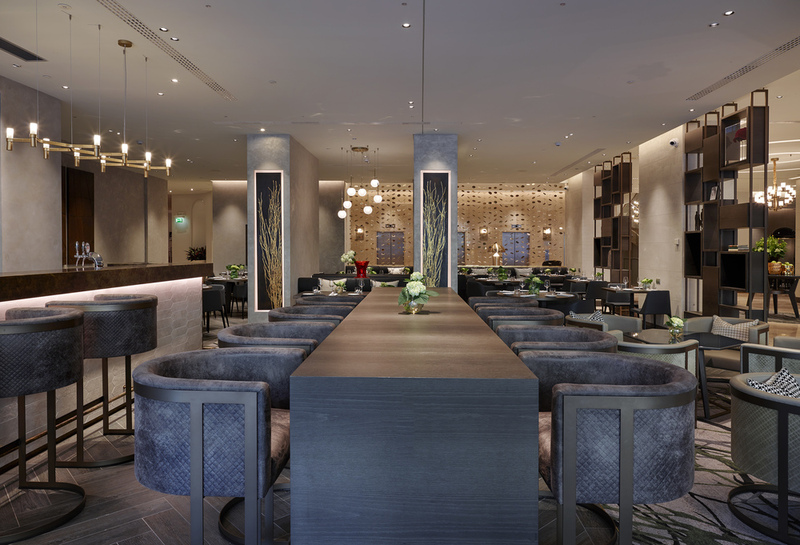 The Lobby Bar is open throughout the day and into the night offering service and menu items evolving in keeping of time of day and the F&B "Concept 45". From morning pastries to lunch, to aperitivo time for salumi, prosciutto, formaggi, to finally the dinner menu of regional dishes from the regions struck through by the 45th parallel. 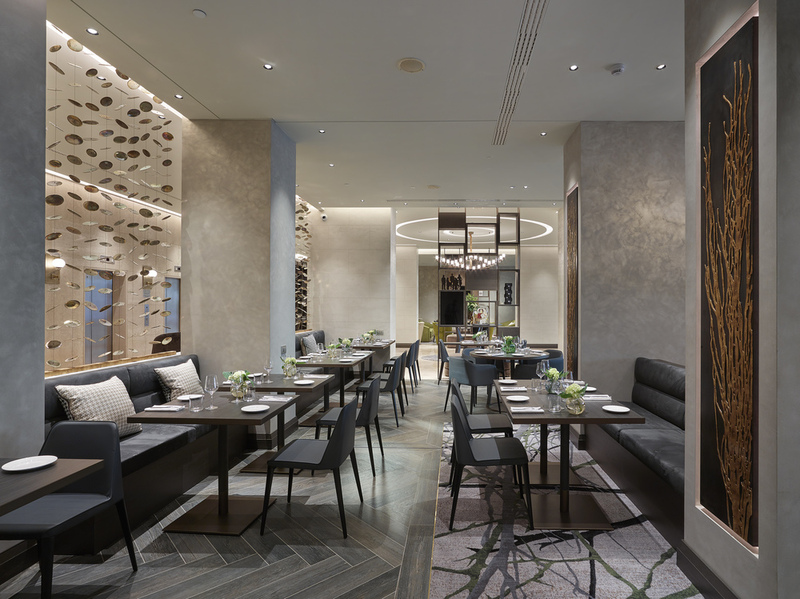 It’s purpose to attract guests from the lobby to enjoy dining in a more relaxed and informal way. The design of the bar and bar wall reflects the flexibility required by the changing service, with the bar display changing setting by swivel doors open during the day to complement the cappuccino maker closed at night and ready for evening cocktails. The multiple seating arrangements offer several height and comfort options for different dining activities from a light cappuccino to a full dinner. 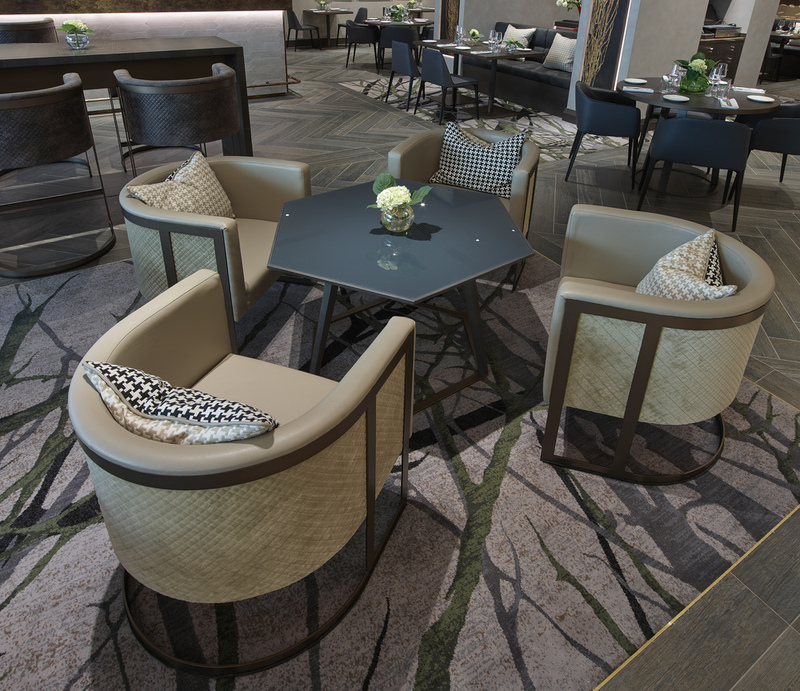 The variable seating options available throughout the lobby and salon areas, offer solutions to varying social uses, from relaxing to informal meetings. The open plan centrally positioned fire place is visible from all sides and becomes an un-missable focal point for all areas within the lobby. Guest rooms area a haven for relaxation and sleep. The colour palette is elegant & sophisticated, with neutral finishes rich in feel and texture. There is wall paneling behind the bed, and the headboard is deeply upholstered will add a sense of elegance and calm to the room. The broad sweeping curves of the furniture, the headboard and the night tables recall shapes first used in the reception and foyer. 147 Double rooms and 65 Single Rooms were upgraded during 2015 and the completion is due during 2017. The sensuous curved shape of the new desk was a designed to act, not just as a new work space to one side of the bed, but also to develop the narrow small space between the end of the bed and the wall, effectively creating a shallow wall console which extends and develops the desk arrangement. The wall paneling behind the desks directly matches that of the bed, and acts as an anchor for the wall desk, the horizontal line of the desk is picked up and continued in the veneer detail of the new minibar and wardrobe, accentuating its curved movement. The desk and night tables are glass topped to add a reflection and a sense of space to the interior. The interior of the wardrobe and the night stand drawers are in an accent laminate finish. The Gala Ballroom meeting room was developed in 2014, and comprises of a 400sq metre ballroom which is divisible into three separate meeting rooms, there is a large breakout space which can be used between meetings or as a gathering space prior or after an event. The 9 Meeting rooms, 2 Boardrooms, interior & exterior breakout areas were developed by THDP in 2011 - 2012, we designed the wardrobes and credenza as well as the carpet for the rooms.